Three black guys from north Minneapolis walk into a largely vacant office building on a drab industrial corner of St. Paul. They don't have much cash, but they think they're funny, and they're pretty sure other people think they're funny, too. So, they open a comedy club focused on comedians of color. Financially it's a grind. 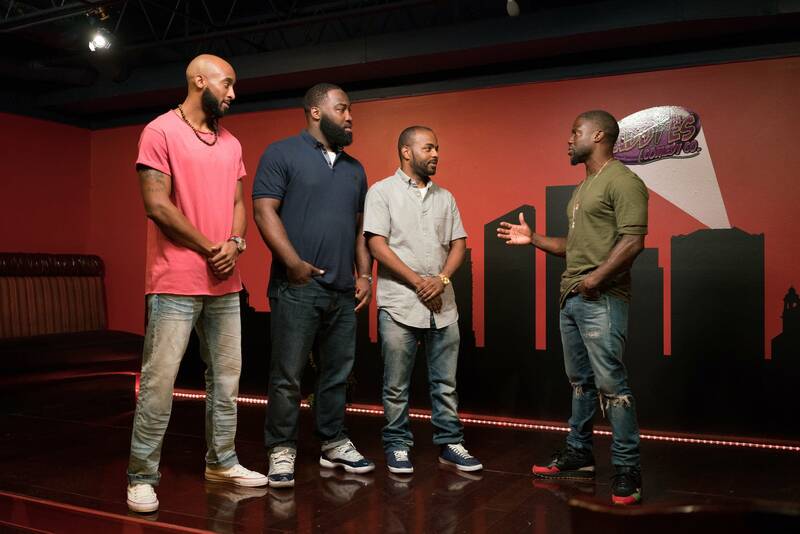 But then one day, after being open for only a few months, international comedy and film megastar Kevin Hart shows up and says he wants to put them and their industrial park comedy club on national TV. It sounds like a joke, but it's not. Hart flew in to the Twin Cities earlier this month to film an episode of his Comedy Central series, "Hart of the City," at Baddies Comedy Co. Hart's show gives national exposure to talented but undiscovered comedians in different cities. Baddies, which opened in February, is a labor of love for the three local comics who wanted to bring diversity to the Twin Cities comedy scene by consistently providing stage time for comedians of color. Hart's spotlight may soon make it a much bigger deal for the owners, and the region's comedy business. 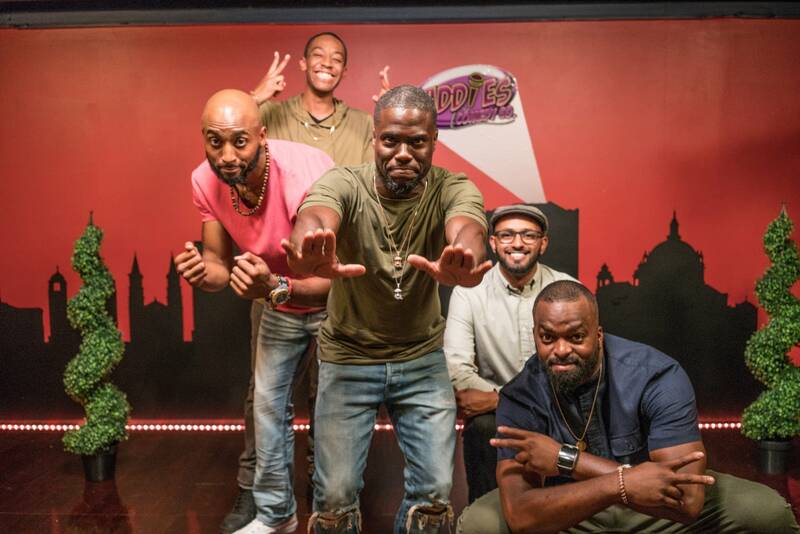 The Twin Cities is an untapped market for African-American comics, said Baddies co-owner Pierre "Cool P" Douglas Sr. "While comedy is universal, there are cultural differences," he said. "There were comedians from out-of-state who wanted to come here and people willing to pay to see them," Douglas said. "But there was no set place to go see urban comedy on a regular basis." He and his partners — fellow north side comics Bruce "Leroy" Williams and Brandon Riddley — started doing standup in 2012 but stage time at mainstream clubs was hard to find, and laughs were harder to come by. "I would go to all these places where it would be saturated with comedians that didn't look like me, for one, and didn't tell the same jokes I told, for two," he said. "So, the audience wouldn't understand what I was talking about. I want to tell my kind of comedy in front of people that will understand." At Baddies, the comedy is steeped in black experience and culture. You might hear the whoops of a black preacher or see the fancy footwork of a holy ghost dancer as Douglas does impressions from his upbringing in a Baptist church. 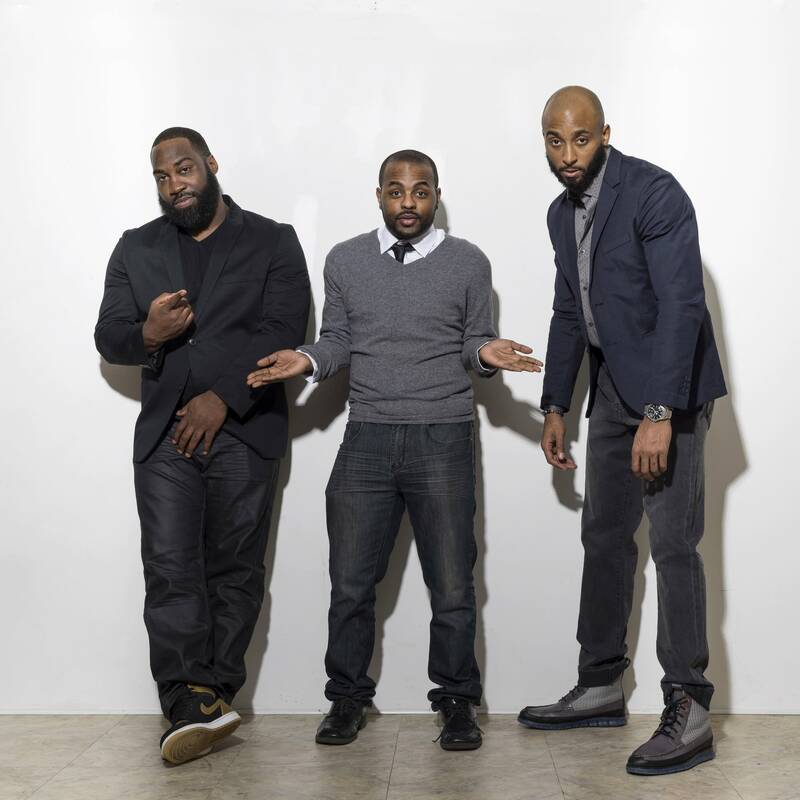 Baddies Comedy Co. owners Pierre "Cool P" Douglas, Brandon Riddley and Bruce Leroy Williams started a makeshift comedy club in St. Paul six months ago. Courtesy Baddies Comedy Co.
Before Baddies, Douglas, 31, was organizing pop-up events in north Minneapolis venues, showcasing local and national comedians. But he wanted to give urban comedy a permanent home in the Twin Cities, so he teamed up with Williams and Riddley. The office space that's home to Baddies is miles from their north Minneapolis home base. But it was affordable. And, oddly, came with a stage and walls lined with booth seating. "It was like, 'All right, I hear you God. I see you,'" Douglas said. "You're making it a situation where we need stability but you're making it low-cost, so it's there." Baddies opened in late February, and it's already spawned new comedians, including Brayshaun Gibson, a north Minneapolis construction company owner. "I didn't think I was cut out for it," said Gibson, 25. "I could make you laugh but I'm not a comedian, so I didn't take interest in going on stage even during an open mic." But Douglas persuaded him to take the Baddies stage a few months ago. Since then, Gibson's been doing weekend shows, recently landed his first paying gig at another club and is organizing a pop-up comedy show next month. "The real addictive part is the laughs, you always want to get as many as possible, as big as possible," Gibson said. Baddies stage has also been extended to other comics and communities color. And its owners want it become a multicultural venue. But if Baddies has been a comedy success, Douglas said the business side has been rocky. "It's been tough as owners because we self-finance; everything is out of pocket," Douglas acknowledged. "So, if we don't make money that night. It's like [expletive], I've gotta pay [my] rent and I've gotta pay rent here too. It's tough." Their hard-scrabble effort, though, captivated Hart, who said he was impressed with Baddies' owners creating an opportunity instead of decrying the lack of them. "As comedians, I feel like we're a fraternity and we should support each other. My goals are to simply reach back and grab as many people as I can and create as many opportunities as I can," Hart said in a recent interview. "When you have people doing things like this to break barriers, this is what you should shine a light on," he said. "You have to applaud these brothers for coming up with the idea, creating a room and bringing comedy to people every night the way they feel like it should be brought." Hart's team chose the club over well-established and iconic venues. "Baddies has a very, unique story, and it touched us," said Joey Wells, an executive producer of Hart's show. Dozens of local comics, including all three of Baddies' owners, auditioned earlier this year for the Twin Cities episode. Four comedians made the cut, including Baddies co-owner Williams. "It didn't hit me for a while, to be honest with you," Williams laughed. "I was in the gym, working out. And I just broke down in the gym, right in the gym, in front of everybody. I was crying all loud and laughing at the same time, because it was tears of joy coming out. People were looking at me like, 'What the hell's wrong with him?'" Comedians Ali Sultan, Earl Elliot, and Greg Coleman II will also appear in the half-hour episode, doing skits, stand-up routines and being interviewed by Hart. Wells said some of last season's comics have gone on to national tours and their own Comedy Central specials. When he and Hart conceived the idea of the show, they hoped it'd be a launch pad for national careers but also have a local economic impact. "That's why I'm really hoping when this airs Baddies becomes so successful that you can't even get in here," Wells said. Hart interviewed all three of Baddies owners in a separate segment of the show. The second season of "Hart of the City" premieres in October. Douglas said Hart's endorsement validates their vision and is a major break for the new club. "Just six months in, this is huge for us," he said. "As comedians, we're like, 'This is crazy.' It's still unbelievable. As businessmen, it's like, 'How we keep that exposure going?'" Correction (Aug. 31, 2017): Pierre "Cool P" Douglas Sr.'s age was incorrect in an earlier version of this story. The article has been updated. Editor's note (Sept. 5, 2017): At the time this story was published, Baddies was temporarily closed due to a building renovation. The club reopened Sept. 3, 2017.